Commodore VIC 20: A Visual History is a book about the computer that made Commodore enter the home market, with all its early peripherals. The VIC 20 was the first colour home computer to cost less than $300, the first to sell one million units, the first to have a modem for under $100, and the first approach to personal computing for a whole generation. Many books celebrate the even more successful Commodore 64, but I felt that its little brother deserved some attention too. “A visual history” doesn’t mean that there won’t be any text: every chapter will have an introduction, and there will be some contributions by the VIC launch team (known as the VIC Commandos). The first half of the book will show all the VIC models and revisions, from the Japanese VIC 1001 to the cost-reduced VIC 20 sold worldwide; there will be pictures of all the peripherals that Commodore released for this computer such as drives, printers, the VICmodem, expansions, joysticks and paddles. Here’s a mock-up of a few pages; the graphic layout of theese pages and the cover are designed by my long time friend and partner at work Raffaele Lodolo, a graphic designer with 25 years experience. Content and graphic layout are not yet definitive. The second half of the book will present all the Commodore games on cartridge, with cover scans, descriptions and screenshots. A few games will feature a double page image, with all the text patiently removed in Photoshop to reveal the beauty of the original illustration. The scans will be professionally color corrected to remove the ink fading and the yellowing of the cardboard (all the games are more than 30 years old); every scratch will be removed to present the covers in their original splendour. Sure! Greetings to all the readers. In 2008 I started a blog http://vecchicomputer.com (in Italian) about my old computers and consoles, where I wrote my memories about them. I didn’t want to merely list technical specifications, I find it quite boring when I read the same articles over and over again… “this system has 64KB RAM, 32KB ROM, a tape port”, and so on. Nothing new, nothing personal. I started by adding a very basic image, just to catalogue my collection, then I slowly developed my photographic skills, and my pictures were getting better in every post. In 2012 I started another site in English (http://oldcomputr.com), I bought an external flash for my DSLR, and the pictures began to be an important part of my posts. After all, I can’t have personal memories about everything I collect, but I still want to publish something interesting. The idea about a monographic book on the VIC 20 came to me last year. It was a revelation. I was working on my computer and the idea just popped out from the back of my brain… the more I thought about it, the more it seemed a good idea! A lot of books on the C64 but none on its older brother. A system that kickstarted the home computer revolution. The first “family” computer. I already had many of the Commodore cartridges. I owned a few VIC 20s and most of the early Commodore peripherals for the system. I started to look for missing hardware and games, and to learn more about the story of the VIC 20. I had already read the awesome book by Brian Bagnall, then I read Michael Tomczyk’s book “The Home Computer Wars”, and many old interviews and magazine reviews. 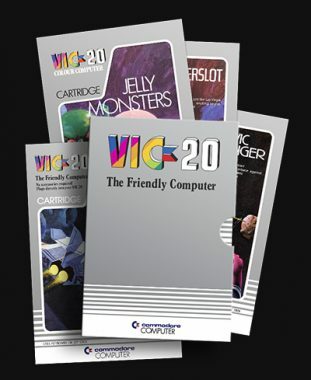 Many of the backers of the Kickstarter campaign confirmed my thoughts: “Finally a book about the VIC 20!”. I won’t reach thousands of copies, because the VIC 20 is a niche computer in a niche “retro-books” sector, and it was soon eclipsed by the success of the Commodore 64; but many kids of the early 80s started their computer experience with the VIC 20. A lot of people have seen the quality of my pictures (I’ve been using Photoshop for my work since 1995) and liked them, and the book will feature many photographs of the VIC system. The covers of all the Commodore games on cartridge will be there too, so it will be a nice reference book about the VIC 20. Some have called it a picture book but that’s not quite true. There will be chapter introductions with some history, citations from books and magazines, and a few contributions from the team that launched the VIC on the market. Before this one I ran another unsuccessful Kickstarter campaign for the book. I made the mistake of proposing it in two languages (Italian and English), doubling the printing cost and the Kickstarter goal. It was my very first campaign and I learnt a lot about the platform, the backers, and from other creators. When I started the present campaign, many of the previous backers returned and the book was funded in one day. The support I’ve had from all the people that put their trust in me and my project has been really amazing! I plan to have it ready by the end of November; I hope to deliver it before the Christmas shipping jam. This will be my first one; I hope that it will be the first of a series! My parents bought me an Atari VCS in 1982. The console came with a few games: Combat, Breakout and Pele’s Soccer… the price of new games was quite high at that time (at least here in Italy) and we never bought other cartridges. I still remember when a classmate showed me Moon Patrol on his 2600 – I was really envious! It costed 200,000 Italian Lire, that are about 377€ / 425$ in 2016. Lots of money for a single game. But maybe the first approach to gaming was a Lady Bug arcade game in the back of a bar in the small village I lived in at that time – still 1982 I think. Well, my first computer was a Sinclair Spectrum in 1984, but none of my classmates had one – they all had a VIC 20 or Commodore 64. The next year my parents bought a Commodore 128 with the SuperScript word processor for their work, and I used it mostly in C64 mode. The first computer of my collection was a Commodore 64 in 1994, so that is my favourite. My best gaming memories, saving some money to buy blank floppy disks, exchanging games with my friends… it was all on the 128 in 64 mode. Besides the Atari VCS, I never had a console until 1997 when I bought a PlayStation and I returned to gaming after a pause of a few years – and I never stopped. The PS1 is more than 20 years old so it is retrogaming after all – that’s my favourite console. Every time I hook up a Commodore 64 I plug in my 1541 Ultimate II and I launch Ghosts’n’Goblins, so that’s my favourite C64 game. Another one I like a lot is Paradroid, and another arcade conversion – Bubble Bobble. On the PlayStation 1 I really loved Final Fantasy VII. And Resident Evil, Silent Hill, Oddworld, Metal Gear Solid. I like easy and relaxing platform games like Ratchet and Clank, first person shooters such as Crysis, Resistance and Killzone, and games like Mass Effect, Uncharted, or the last Tomb raider on PS3. And some races in Gran Turismo once in a while. Now that I have a console and a lot less free time, I have to choose the games more “wisely”, and my biggest disappointment has been Final Fantasy XIII on the PS3. So much waiting for a game on rails that by the time it got open world I was already tired of playing it.